Last night, I hosted an event about digital currency for my organization- The Future of Accounting. We have over 350 members and our mission is to connect accountants with technology providers that will help them improve their practice and lifestyle. With Kurt Kunselman, co-founder of AccountingSuite. We love Libra and their tax product (LibraTax). The best comprehensive tool to calculate capital gains/losses for digital currency. Sponsored by AccountingSuite and CalCPA, which has over 40,000 members, we had a great turn out in spite of the busy tax season. Digital currency. Tax season. It was the perfect time to have a discussion about how tax professionals should handle digital currency. Jake Benson, CEO and founder of Libra, led a very informative discussion/presentation about why CPAs and tax professionals need to start learning about digital currency and how to advise their clients. Jake Benson, CEO and founder of Libra. His company has been featured in Bloomberg, the Wall Street Journal and Forbes. But, wait. Do people even use digital currency? What is digital currency? As a tax professional is it even worth your time to learn about it or is it just for the anti-government, anti-bank crazies that mindlessly roam the earth? As it turns out, yes. Tax professionals do need to learn about digital currency because there are plenty of people that are using it. An estimated 6 million individuals use it and 80,000 merchants have Bitcoin on the balance sheet. And with the IRS guidance issued in March 2014 that digital currency is a "property", there are plenty of accounting and tax challenges that go along with it. Packed house of financial professionals eager to learn about digital currency and its tax implications. The group asked a lot of questions and walked away with answers...and more questions. Bitcoin is still a new concept and the IRS is still grappling with how to best handle it. If you are an accountant, one question you need to ask all of your clients during this season is "have you transacted digital currency during this past year?". William Perez, EA and writer for About.com compiled a list of the 10 things he learned from the presentation. For more resources, check out Libra's website and the Digital Currency Council- a professional body for those in the financial industry. William Perez, EA. Writer for About.com. Adriana Lewis, CPA and Senior Tax Manager at BDO, LLP. Meredith Johnson, CPA and CFP, manager at Burr Pilgir Mayer and Chairperson at CalCPA. Great food (Mediterranean is my absolute fave! ), wine, and a lovely group of engaged financial professionals eager to embrace technology to take their profession to the next level. We had a blast! For information on our upcoming events, visit Future of Accounting. Delicious spread. Thank you, CalCPA! We do love CPAs, Libra and of course, wine! 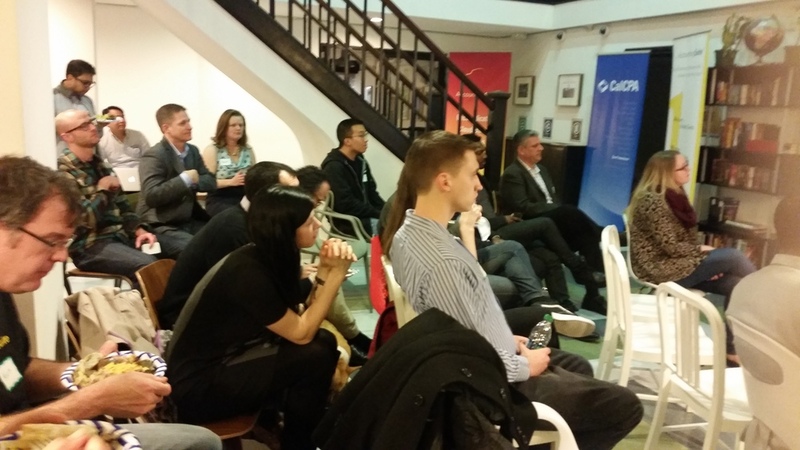 And a BIG thank you to everyone who came out including Justin Hobbs (Xero), Vik Agrawal (ExpensePath), John Gillingham, CPA, Sandy Kwon (FundingCircle), Kiet Luong (AccountingSuite), Randi Ward (CalCPA). Danetha Doe is the host of #FutureofMoney, a weekly Youtube show highlighting how digital currency is affecting the accounting profession. Connect with her on www.danethadoe.com or on Twitter @danethadoe. Newer PostJennifer Lopez and do you need an accountant to file your taxes?